This is an original Etching limited to 55 only c1920, it is hand signed and comes with a certificate of authenticity. In 1995 under copyright law Leda was released as a limited edition Facsimile etching print and limited to an edition of 550 complete with certificate of authenticity. Image size is 30.4 x 25.1 cm and was published in 1995. Norman translated his passion for Greek myths into numerous pictures. The legend of Leda and the Swan has been the subject of art and literature since the time of Homer. Zeus, the king of the gods of Olympus, transformed himself into a swan so that he could seduce Leda, the wife of King Tyndareus of Sparta. Helen of Troy was one of the children of this union. In Norman’s sensitive etching Leda, the seduction is shown by the statue in the background. 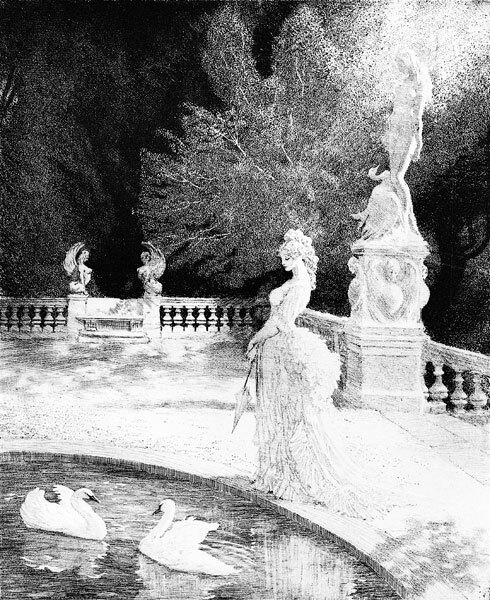 This latter-day Leda, in serenely contemplating the swans, is creating her own myth.